Bobrick B-26212 Classic Series Surface Mounted Paper Towel Dispenser. This unit is built with stainless steel and has a satin finish. 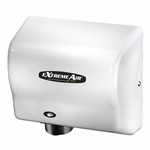 It dispenses 200 C-fold or 275 multifold paper towels that measure 79-97mm deep without adjustment or adapters.